Earrings are one of my favorite forms of self-expression. They help me show off my silly, funky side, and they can be great conversation starters. I match my earrings to my mood, and sometimes to my outfit. When I was younger, I was particularly drawn to big, dangling earrings. Most of them were silver, to match the bangles I was also collecting. As I got older, I added more color to my collection and eventually even some gem stones. I have a lot of earrings. In the beginning, it was difficult for me to keep track of them all. My mother invented the perfect solution. 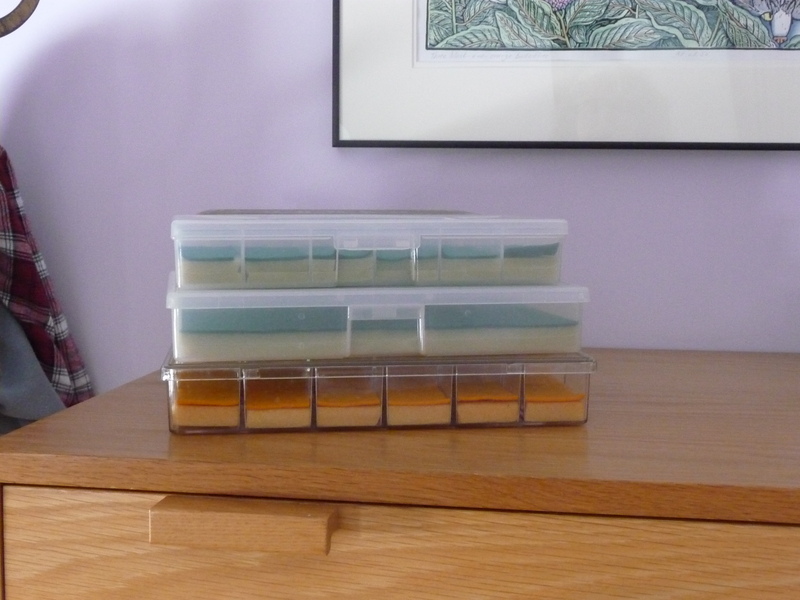 She bought a flat, plastic box, with rows segmented into squares, probably intended to hold fishing tackle, and turned it into a jewelry box. She put a layer of foam in each square to raise the floor, and then cut pieces of felt to fit on top to give it a more finished look. Since the box was clear plastic, I could peruse my collection and choose the pair I wanted to wear before I opened it. To accommodate the larger earrings, she gave the same treatment to a box with a different layout, and when the original two boxes ran out of space, she made me yet another one. I loved those boxes. Then I met Andrew. We’ve been married almost twenty years, and for most of that time he has been on the prowl for a “proper” jewelry box. My unique storage system never appealed to his more sophisticated aesthetic sense. However, he knew that convincing me to abandon my mother’s boxes would be difficult, and he was nervous about committing to a new one without my express approval. He continued to look and offer alternatives, but I never saw one that I liked more than what I already had. This past birthday, Andrew stopped seeking my approval and presented me with a new jewelry box made by Heartwood Creations in Illinois. I readily acknowledged that it was a beautiful piece, but even so, I was stunned that he’d finally gone through with it, and I was secretly pleased to discover that the artful, handmade box presented a couple of unforeseen challenges. My bureau is tall, and with the box on top, I couldn’t see into the drawers. And although it was big, it was not big enough to hold my entire collection of earrings. The first problem was easily solved; the new jewelry box would live on Andrew’s bureau, which is considerably lower than mine. The next problem was much more difficult. I had tried to cull my earring collection once before, but only got as far as moving some into yet another box and hiding it away under never-worn-lingerie. I forced myself to try again. Each day, I moved a few pairs of earrings into the new jewelry box, setting aside any that I knew I’d never wear again. I added those to the box that lived under the lingerie, until that box could hold no more, and still I squished them in. 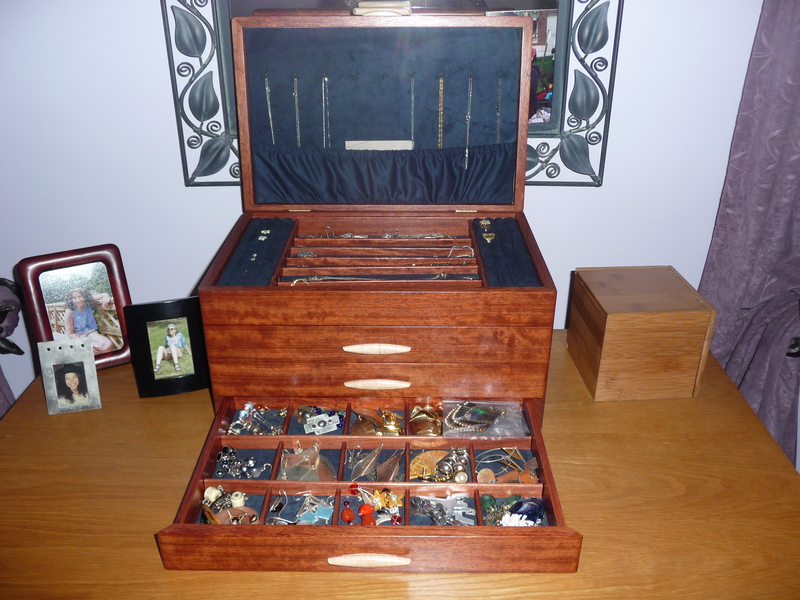 After a while, I began to appreciate how handsome the new jewelry box was, how grown-up it looked, and how much fun it was to open the drawers to choose my earrings for the day. Full of resolve, I put all the earrings that were not making the move to the new box into a big, plastic bag and brought it down to the kitchen counter—where it still sits. But I assure you, it’s only a matter of time, because nothing dims nostalgia like the loss of counter space. This entry was posted in Uncategorized and tagged earrings, handmade jewelry boxes, Heartwood creations, homemade jewelry boxes. Bookmark the permalink. Wow. The most amazing part of this story is unstated: that Andrew gave up all of that space on top of his bureau for you is amazing. You must give him many kisses and space on top of your bureau in compensation.